The American Academy of Pediatrics has a policy statement on child passenger safety with recommendations and guidelines for car seats. These recommendations change over the years as new research and information become available. 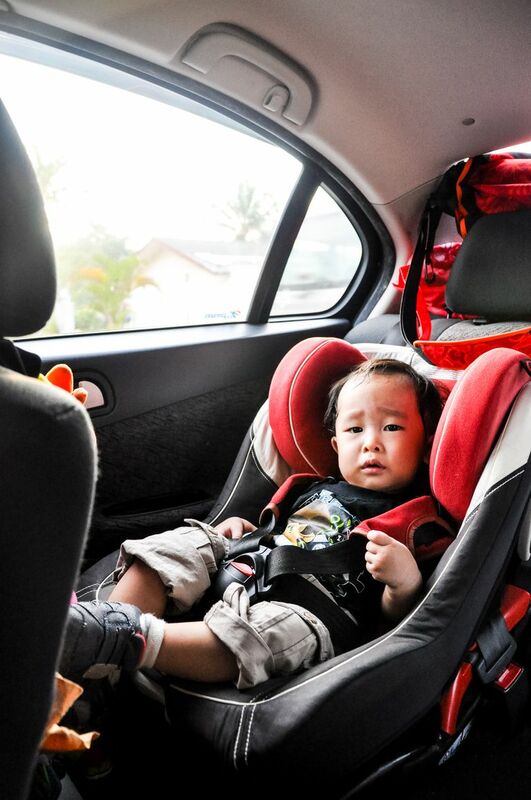 See what their current guidelines say for keeping children safe in your vehicle and see where to find the best car seats. Infants and toddlers should ride in a rear-facing car seat (infant-only rear facing car seat or rear-facing convertible car seat) until they are 2 years old or until they have reached the weight and height limits of their car seat. Although this means that some larger infants and toddlers might have to graduate to a rear-facing convertible car seat, there are several models of infant-only seats with higher, 30- to 35-pound weight limits that should get you to the next car seat safety milestone. Once they are 2 years old (or, regardless of age, have outgrown their rear-facing car seat) toddlers should sit in a forward-facing car seat with harness straps as long as possible and until they reach the weight and height limits of their car seat. Keep in mind that many convertible car seats and combination car seats have forward-facing weight limits of 65 to 80 pounds when used with harness straps. Kids can next move to a belt-positioning booster seat when they reach the weight and height harness strap limits of their forward-facing car seat. The move to regular seat belts should not occur until kids are "old enough and large enough" for the seat belts to protect them properly, which usually isn't until they are 4 feet 9 inches tall (57 inches) and are between 8 and 12 years old. All kids under 13 years of age should sit in the back seat, using an age-appropriate restraint. These guidelines were issued in 2011 and reaffirmed in 2017. Infants and younger toddlers are at greater risk for head and spinal cord injuries if they are in a forward-facing car seat instead of a rear-facing car seat, which provides better support for their head. The best car seat is one that is used correctly. Tight is Right: Make sure your car seat is installed tightly using a seat belt, or LATCH if it is available. If, when holding the bottom of the car seat, you can move the seat more than 1 inch, then it may not be installed tightly enough. Seat Belt Readiness: Your older child isn't ready for regular seat belts unless he can sit with his back against the seat and have his knees bent at the edge of the seat without slouching, with the shoulder belt lying against the middle of his chest and shoulder (not his neck), and the lap belt against his upper thighs (not his abdomen). Avoiding Common Car Seat Mistakes: In addition to choosing the wrong type of seat for your child's age, common car seat mistakes include having loose harness straps, not installing rear-facing car seats at a 45-degree angle, and not using LATCH when it is available. Pickup Trucks: Children should never be allowed to ride in the cargo area of a pickup truck and parents should be aware that the smaller rear seats of some compact extended-car pickup trucks may not be as safe as other cars and trucks with larger back seats. Register Your Car Seat: You will be notified of any car seat recalls if you register your car seat. There are many state car seat laws that need to catch up to the AAP car seat guidelines to help keep kids safe. Parents should remember that they should do what is safe for their kids, even if it likely exceeds the requirements of the state car seat laws where they live. Is there a best car seat for your child? With the big differences in prices for car seats, one would think so. It is important to keep in mind that all car seats must meet the same federal safety standards and crash performance standards. According to the NHTSA, "the best car seat is the one that fits your child properly, is easy to use, and fits in your vehicle correctly." Some car seats and booster seats are easier to use than others though, either because they have clearer instructions, are easier to install, have better labels, or make it easier to secure your child correctly in the seat, which can be seen in the wide variety of ease of use ratings that car seats get. In order to follow the latest AAP car seat guidelines, you might also try to find a car seat and/or booster seat with high weight and height limits, so that you don't have to move your child to a new seat before he is ready. See the car seat product listing at HealthyChildren.org, which is updated yearly. It includes weight and height restrictions as well as price ranges. American Academy of Pediatrics Technical Report. Child Passenger Safety. Pediatrics 2011;127:e1050-e1066. Car Seats: Information for Families. American Academy of Pediatrics. Updated 2/7/2017. Child Seats: Ease-of-Use Ratings. NHTSA.